Hatsuichi is the first ichi or market of the year. Good luck charms are sold in hatsuichi, and people buy them every New Year as they burn the old ones at the start of a new year. Daruma dolls are a popular form of good luck charm here in Gunma because approximately 80% of the country's daruma dolls are produced in Takasaki. 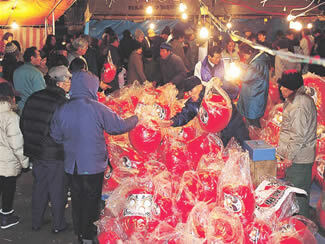 Daruma merchants, who are members of a union, sell them at "hatsuichi", starting with Shorin-zan in Takasaki, where daruma dolls are originated. They move around cities in Gunma to sell daruma dolls at different locations on different days. Hatsuichi attract a huge crowd, so roads will be closed to traffic. Here is the information on hatsuichi at some cities in Gunma. Honmachi-dori Avenue and shopping streets of downtown Maebashi will be closed to traffic for the hatsuichi. 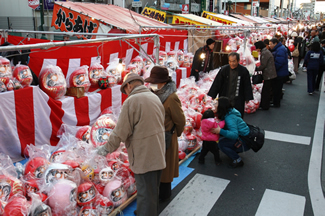 Merchants sell daruma dolls and other good-luck charms. At the Honmachi Hachimangu Shrine, people bring their daruma dolls from the past year for the shrine priests to burn in accordance with a Shinto ritual. There will be a mikoshi (portable shrine) procession in the area. Honcho-dori Avenue is closed to traffic for the hatsuichi. In addition to selling daruma dolls, many stalls will be set up and B-grade gourmet dishes and other interesting things such as plants will be on sale. As part of the hatsuichi, a festival featuring four gigantic yakimanju (roasted buns with or without bean paste) will also be held at the nearby shrine. The giant yakimanju will be served to visitors after the festival. Hatsuichi from 12 noon to 9:30 p.m.
Yakimansai (Yakimanju Festival) from 2:00p.m. Hatsuichi in Tatebayashi has an over 100 year-old history. Shopping streets of downtown Tatebayashi attract a large crowd. People want to buy their New Year's daruma dolls, but they also come to enjoy the festivities and the nearly 200 stalls that sell all kinds of interesting things. The festival features many fun events for families. Candles lit in the snow makes you feel as if you were in a wonderland. Tubing is popular with children. A cup of hot soup (either oshiruko or sweet red-bean soup with rice cakes or tonjiru, miso soup with pork and vegetables) will be offered from 3 p.m. to a limited number of visitors. 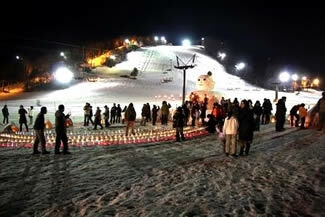 The festival features family sporting events/games on the snow and a raffle with deluxe prizes such as free lift tickets, onsen bathing tickets, etc. For more details, please visit their website. Yukake means pour onsen waters on to something/someone. As the name suggests, this 400-year old festival features local young men, who wear only the fundoshi (loincloth or traditional Japanese men's underpants), pour onsen water on each other. In the early morning of the festival day, they appear on the streets of Kawarayu Onsen Spa & Resort. With the Japanese drum beating as a cue, they start pouring onsen water on each other while shouting "Celebrations" to pray for the good year. It's quite a spectacular sight to see and is famous for its uniqueness. The festival takes place on January 20, the coldest day of the year, called Daikan, according to the lunar calendar. As you may know, Kawarayu Onsen Spa & Resort will go underwater once Yanba Dam is completed, the construction of which is currently suspended.